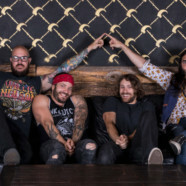 Mascot Label Group has announced the signing of Crobot to a global recording agreement with Mascot Records. Known across the world for their unique blend of good old-fashioned hard rock with funk, blues and other elements of musical inspiration combining to become a howling vortex that is uniquely the Crobot nebula. The band is currently working on their next release. The upcoming album follows prior releases Welcome To Fat City (2016), Something Supernatural(2014) and Legend Of The Spaceborne Killer (2012). The current line up is Brandon Yeagley (Lead Vocals, Harmonica), Chris Bishop (Guitar, Vocals), Dan Ryan (Drums) and James Lascu (Bass).